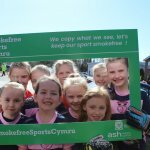 As smokers across Wales give up smoking using e-cigarettes, vape shops have become a popular fixture on our high streets. 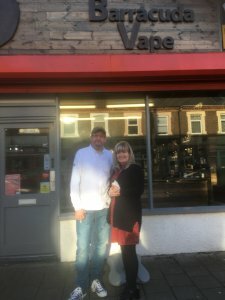 We met the owners of two different shops to find out more about what inspired them to set up their businesses and how they help smokers to quit the habit. Husband and wife team Lee and Amanda Woolls were heavy smokers before giving up using e-cigarettes. Their experience inspired them to open Wales’ first vaping shop and today they own 11 Barracuda Vape shops across the country. When did you first discover e-cigarettes? Lee: We were both smokers. I was on around 60 a day and Amanda smoked about 40. It was just an integral part of our lives. I had been working for several years in the Middle East and in North and South Africa where it’s far easier to be a smoker because cigarettes cost so little and there wasn’t any financial incentive to quit. It was when I hit 40 and came back to the UK that I decided to quit. I had several quit attempts but none of them worked. I tried using Champix medication but I didn’t get on with it, then I tried gum and lozenges but that didn’t help with the cravings. Then a friend suggested that I should try e-cigarettes. I was very dubious at first because it was 2009 and they had only just become available. But I started vaping and after that I never smoked again. What was it about vaping that appealed to you? Lee: For me vaping just ticked all the boxes. You got the nicotine, the hand to mouth gesture and the visual effect of the exhaled smoke. 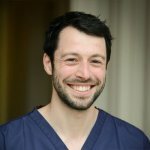 For me, having been a heavy smoker, it was really important to get that hit at the back of the throat. It just seemed effortless, and we became quite evangelical about it after cigarettes had been such a big part of our lives. How did you go about setting up the business? We were working in the insurance business at the time. I started talking to everybody about e-cigarettes and realised that nobody was really using them at the time and that there was a real gap in the market because people were very intrigued about them. We started researching e-cigarettes in detail and looking at all the different component parts of the e-cigarette and all the different liquids available. When we opened our first shop in Cowbridge Road East in Cardiff, it was 2010 and the middle of the recession yet the shop was a success straight away. We used to hold talks and presentations about e-cigarettes and the shop would be full. Demand for the products was crazy and there would be queues of people waiting to get into the shop. It’s 100% because of our own experience and how the product has worked for us that we’re so passionate about our products. 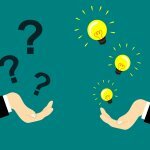 How important is it to you to get to know your customers? Amanda: Customer care is the focus for us, it’s the absolute key stone of our business. There’s no one size fits all product. Everyone gets a tailored service and product. We always ask our customers about their habit. We find out what brand of tobacco they were using because there are lots of different flavours. Some people puff while others inhale that is relevant too when it comes to buying the products. We’ll go through all the products that are available and ask how committed they are. Once they have decided we go through the range of liquids with them. We offer our customers a lot of support and advice and we have a lot of success stories. One lady came in and said she can’t get rid of her craving for a cigarette in the morning, so I advised her to take the vape to bed with her and then have it there ready in the morning. She said that really worked for her. One man came in and said he was going to have to have his leg amputated because of an arterial vein collapse caused by smoking. A year later he said the operation was no longer going ahead because he’d give up smoking and was vaping instead.  What have you learnt from your experience of running the business, about giving up smoking? Lee: The biggest motivator for giving up smoking is oneself. If you don’t really want to give up smoking yourself then you’re not going to, not matter how much others persuade you. It’s all about will power really. Vaping really helps people to cope with the craving for a cigarette when they are quitting and can really replicate smoking. In fact, for some smokers it helps not to think of vaping as giving up smoking, but instead to think of it just as changing their brand or the product they are using. 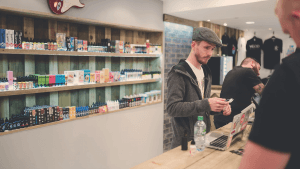 Adam Edgerley runs Juice33, a chain of vape shops in West Wales, with shops in Carmarthen, Haverfordwest, Tenby and Milford Haven. He currently has 1,500 customers with the oldest aged over 90. When did you set up the business and what inspired you to open a vape shop? 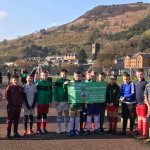 I launched the business with my business partner and best friend Joe back in late 2014, we had both been working for another electronic cigarette firm for a while and saw the amazing potential for growth in the sector, as well as an opportunity to corner the underserved West Wales market. Both of us had been heavy smokers for many years before working in the vape industry, so we’d seen first hand how transformative and effective the devices could be. After many years of pretty thankless jobs, it was a real boost to make a living from something that we could really see was making a difference. Can you tell us about the different ranges of products you stock? We stock a fairly exhaustive range of vape products, everything from very basic pen style starter kits to the more ‘hobbyist’ high powered mods, rebuildable atomisers and Sub Ohm tanks. The most important side of vaping for most people is the choice of e-liquids. In my opinion the ability to choose from such a massive range of different flavours is a big part of why vaping works long term for people. Honestly, the only thing our customers have in common is they are all smokers who want to quit. We have around 1500 active customers on our system, and they come from every imaginable demographic. Our oldest customer is over 90 years old. What advice do you give to smokers who are hoping to give up through vaping? We always start with a new customer’s individual needs. Everyone is different so there’s a certain level of personalisation in what set up we will suggest for someone (nicotine levels that are likely to work for them, what kind of battery life they are likely to require for their lifestyle, certain flavours that may be more suitable than others etc). Why, in your opinion, is vaping the best way to give up smoking? From my personal experience, other smoking cessation devices and techniques don’t quite do the job. While some of them technically satisfy the nicotine cravings, there is a ritualistic element of smoking that they can’t replace. Picking up a physical cigarette or vape after a meal, seeing the smoke (or vapour in this case) as you exhale, feeling the ‘throat hit’, and simply having something to do with your hands just can’t be replicated with patches or any other smoking cessation device I’ve tried. That’s a common theme I hear almost every day in our stores; almost all of our customers have tried to quit before and the feedback we hear about how much easier it is to switch over and stick to vaping is astounding. 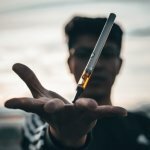 The statistics seem to back up my opinion too; vaping has a 50% success rate, other smoking cessation techniques are around 3%. Do you think there is a lack of awareness generally about the benefits of vaping compared to smoking? Absolutely, there’s been a lot of bad reporting in the national and international media surrounding vaping; stories like the exploding e-cig, popcorn lung or similar make great headlines, but most have been either disproved, or are missing important context. Vaping has been largely vilified and it’s almost impossible for our industry to fight back against the disinformation and misleading headlines because of the incredibly harsh advertising regulations imposed on us as part of the Tobacco Products Directive. I think there’s a huge amount of scope to set the record straight, get the right information out there and encourage people to switch over to an unarguably less harmful alternative. However, I think it’s vital that this is approached with a responsible, measured approach as to discourage non-smokers from taking up vaping.